If I should describe the typical colour of Paphos, Cyprus, I would define it as “tired green”. It’s the association, which pops up in my mind when I look around. Lots of green, indeed, but mixed with dark yellow and brownish. The spot seems like a weird mixture of pre-desert environment and a tropical island. The blooming oleander and begonia bushes add an oriental pinky/red nuance, so the final impression is of an exotic piece of land, secluded in the South Eastern Mediterranean Sea. The day I arrived in Cyprus, I found I already speak fluently both the most commonly spoken languages there. No, it’s not Greek, neither Turkish. I am in the Southern part of the island. The most common spoken language in Cyprus is English. The second one is Russian. Actually, every other label, announcement or slogan in the Cypriot streets is in Russian. Also, all the brochures are bilingual – English/Russian. The biggest Russian colony in Cyprus is in the city of Limassol. That’s why it’s easy to find a job in Limassol if you speak Russian fluently. The vast majority of the visitors, tourists and even local villa owners there are Russians. They are also the main targeted segment for any business in Limassol. Despite that, the Russians, coming to Cyprus, are solvent, which means respected and appreciated by the Cypriots. But I am in Paphos, which is not that much Russian oriented. The main community here was formed by British. It’s my second time in Paphos (can be seen also spelled Pafos). The first one happened two and a half years ago. Then its history, legends and archeological excavations bewitched me. This time I am mainly focused on the people, the environment and the atmosphere – socializing, learning new things and following different paths, related to my career. And I am truly determined to enjoy the upcoming adventure. 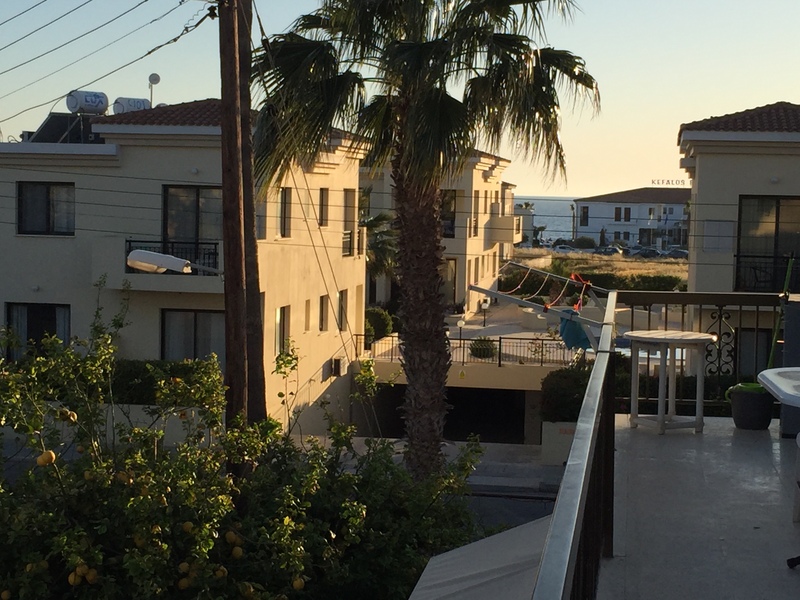 Sitting at my spacious terrace, in the heart of Paphos (a block away from the main boulevard King’s Avenue), I can directly watch the Mediterranean Sea. The view provides me tranquility and relief. In the very beginning of April, I already experienced 27 degrees C. For the first time, I am not in a rush. For the first time I do not have long-term plans. On the contrary – I practice how to move day by day at a slow pace, the way the islanders are handling their life in here. 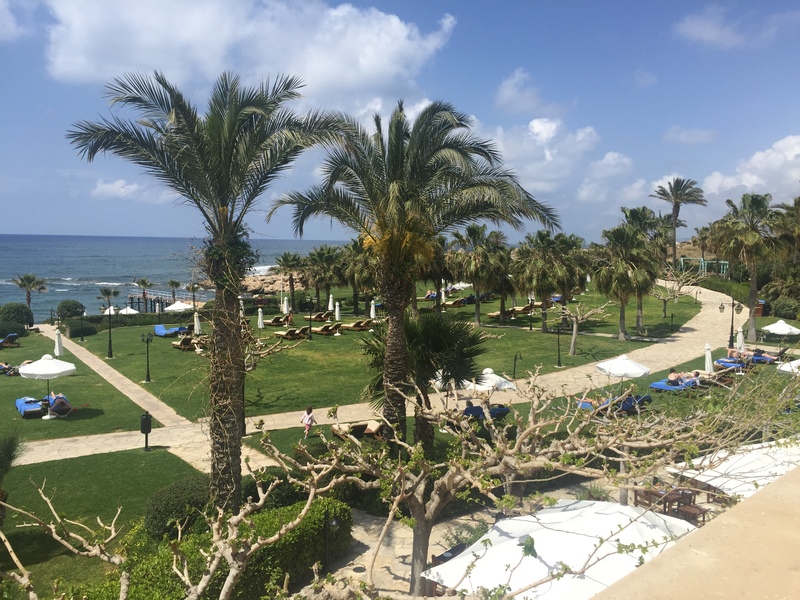 Paphos is beautifully palm tree covered. In between – lots of olive trees, blossoming right now. Flat roof building tops in the typical Greek insular style – everywhere solar panels and huge white boilers. The beaches, though, are not amazing, neither the sand is thin or white. Heavy seaweed flat hills over the beach and the rocks, surrounding the sea. Quite big debris could be found along the sea shore, so the final impression is of a bit chaotic and not well maintained coastal environment. The seawater, though, is transparent and clean, but at the moment too cold for swimming. A fantastic sunny weather all year round. As mentioned above, slow pace of life. Plenty of fresh, delicious, but expensive seafood in the taverns around – squids, shrimps, fish, octopus, mussels… The cheapest fishmeal is about 15 Euro per person. The Wi Fi in Paphos is an extra. It’s difficult to find it free of charge. Usually it’s limited by timing or megabytes. If you find it in the restaurants, taverns, bars and even in McDonalds, the instructions how to connect come with the receipt. So, to use Wi Fi, you should order and consume a meal. I tried to get a local sim card, for resolving the Internet issue. But it’s ridiculously conditioned. A sim card by Cyta Voda, the local provider, with a package of phone calls included is over 14 Euro. Then you should top up, if the amount is over. But no Internet included in this package. For having 3G on site, you should add an additional amount of 7 Euro for receiving only 1 GB Internet. If it’s over – again top it up. A bit better option offers MTN. A local sim card for only 2 Euro, then additionally 1 GB Internet for 10 Euro, or 2 GB for 15 Euro. I am coming from a country, where the free Wi Fi is everywhere and it’s not a matter of place, money or background to get it for free. In addition, having unlimited Internet is ridiculously cheap. So the lack of Internet provision and its expensive side really surprised me. Cyprus is in the EU and even being a remote island, the missing affordable and consistent supply is odd. The climate is really great. Mild and pleasant all year round, it doesn’t matter you come in the beginning of April or in the end of November. The max daily temperatures are about 25 degrees C. The lowest night temperatures during the touristic season rarely drop below 13 degrees C. If it rains, it’s for a short time and then, in a few hours, the sun is back. During the high summer season June – August however hot it is during the day, you are still on an island, which means a slight wind is breezing anyway. I personally hate the air condition, so the cooling insular breeze is just my cup of tea. 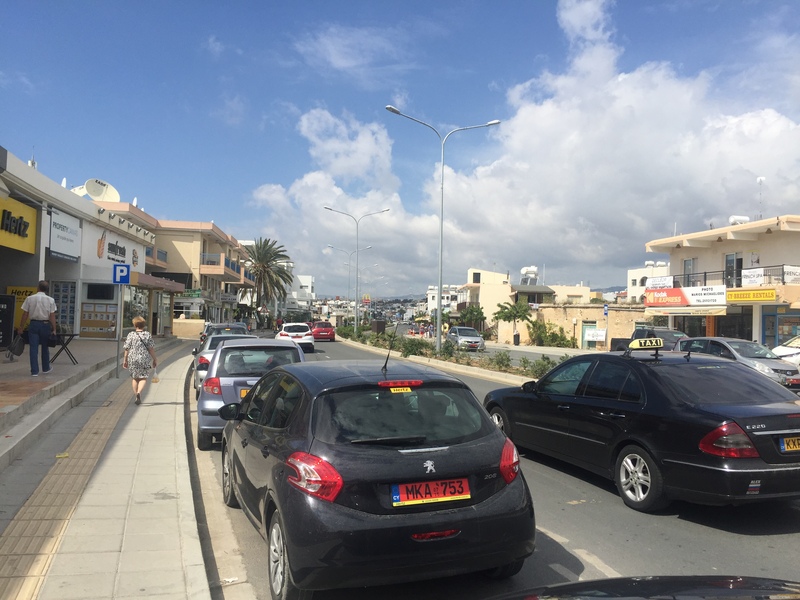 Paphos is extremely pedestrian friendly. Lots of well maintained spacious pavements everywhere. Comfortable traffic lights, easily operated by the pedestrians in the way to always give them an advantage in the traffic. 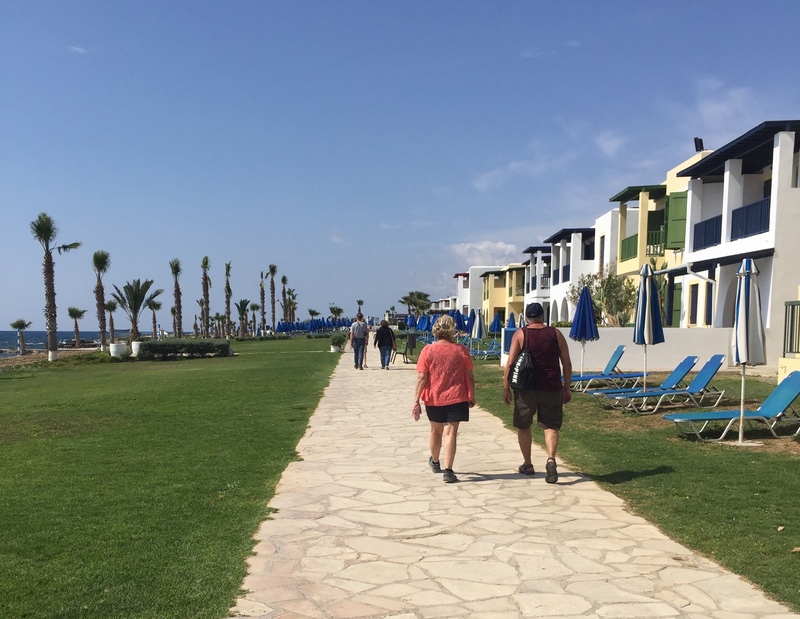 I love walking and it’s a big plus for me that Paphos is walkable. It’s linked to the previous walking advantage. There is kind of a promenade, which is called Broadwalk. It’s a spacious stone built path, passing by the sea shore of Paphos. I have no idea how long is the Coastal Broadwalk in km, but it’s like a belt, embracing the city. 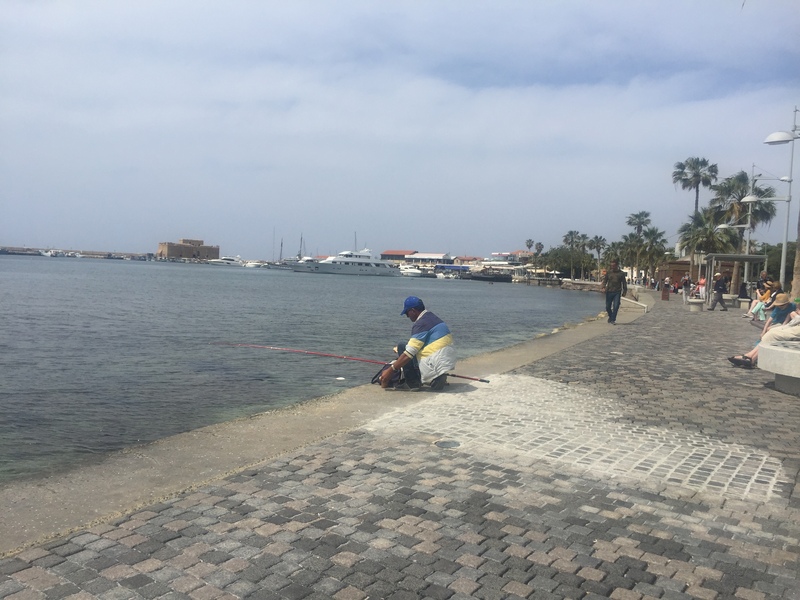 Thanks to the Broadwalk, Paphos can be crossed from side to side through its coast. It’s flat and convenient for whatever activity you name there. Locals and tourists are jogging early in the morning. All day round it’s crowded by walkers. Some people are walking their dogs over. 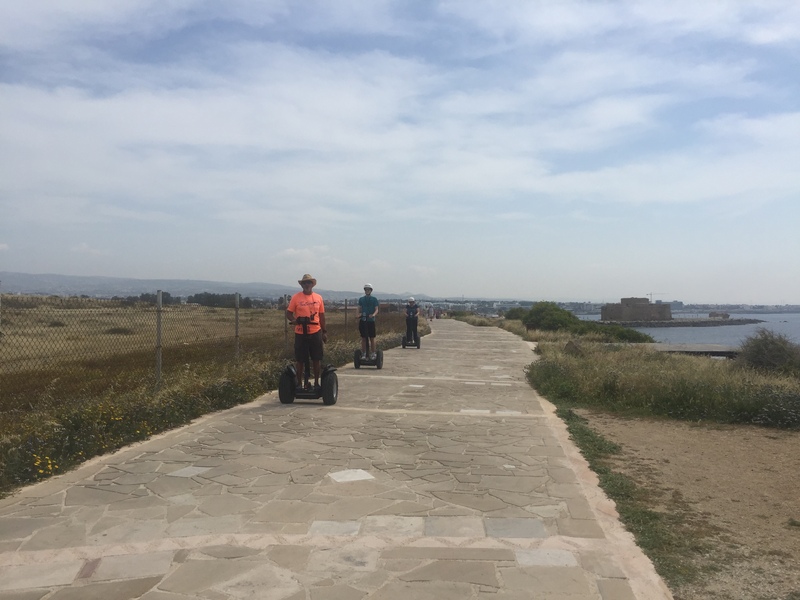 Some tourists use unconventional transport to pass through – dicycles, self-balancing scooters, hoverboards, small buggies, bicycles, etc…The Broadwalk is great for fishing as well. Along the way lots of benches and shades could be found, so if the walker is tired, can take a break. The view to the sea from the Broadwalk is stunning. It’s not the shortest route to cross the city, but for sure is the most spectacular one. Highly recommended!!! I frankly can’t recall another so friendly to the disabled or handicapped people city. Everywhere wheel chair ramps, platforms, decks with comfortable incline, standing frames, charging stations at the airport for electric wheel chairs. There are group discounts for some of the sightseeing for handicapped people. In lots of hotels the facilities are adapted as well. I was pleasantly surprised of such a care and perspicacity. Well, the public transport busses are generally unsuitable to handle disabled equipment, but there are special vans and taxies with low gradient ramps and safety bells, available on site for hire. Some of the historical spots are adapted to disabled people as well, depending on the incline and the location. 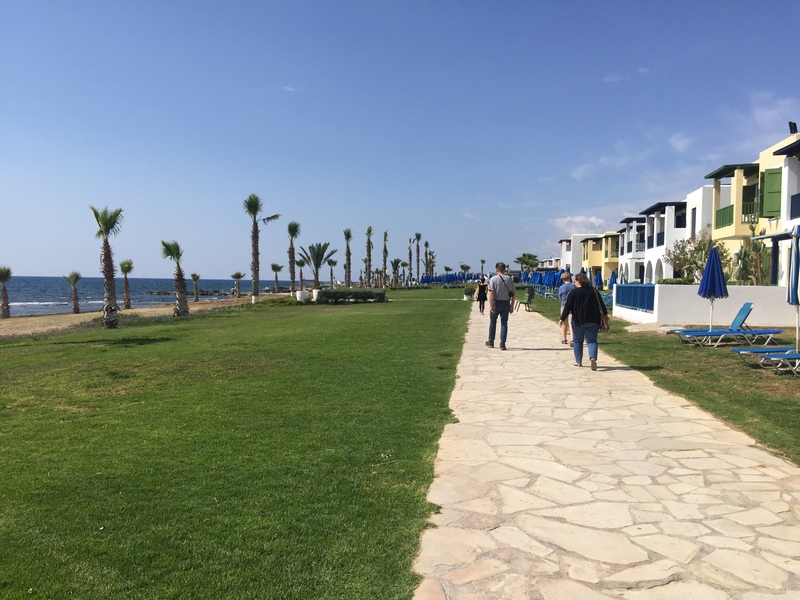 As mentioned above, jogging and walking is a daily activity in Paphos. Some of my fellows here make jokes they are practicing weight lifting every week, by lifting some bottles of beer in the evening. But I mean real sport activities. You know football in Europe is a religion. Same in Cyprus. Could be played everywhere on the beach. If you are not a player, but just a fan, then you are lucky, because in Paphos it’s impossible to miss any important football match. 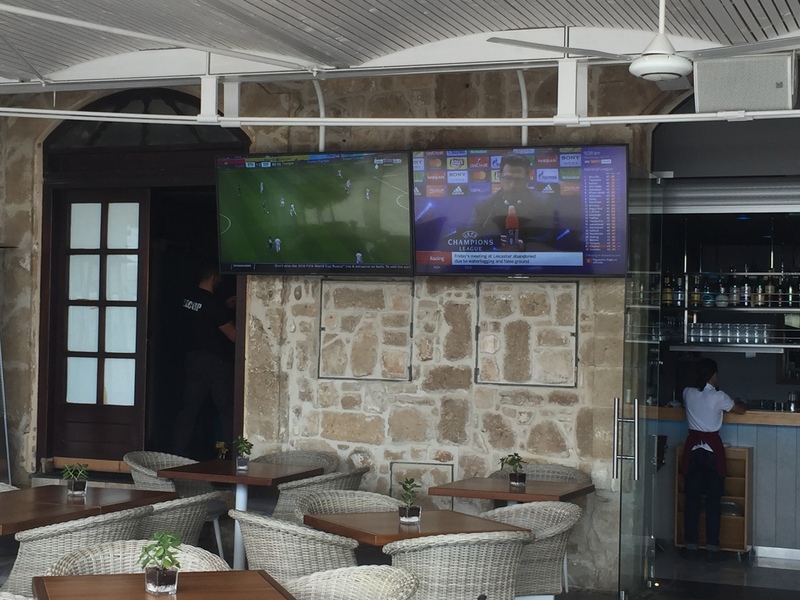 Plenty of taverns offer huge TV screens installed on site, where sport programmes and actual football matches are running non-stop. You don’t know when your favorite football team is having a match? 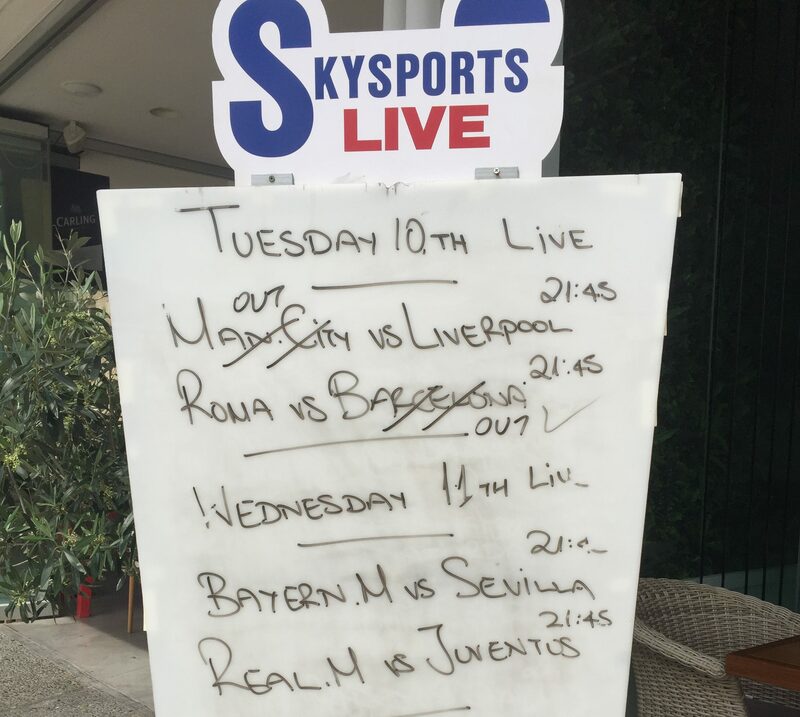 Don’t worry, a welcoming white board with all the matches for the day written on is already placed over. Ahh, you are not a football admirer and don’t care about that game? Then beach volleyball is just for you. 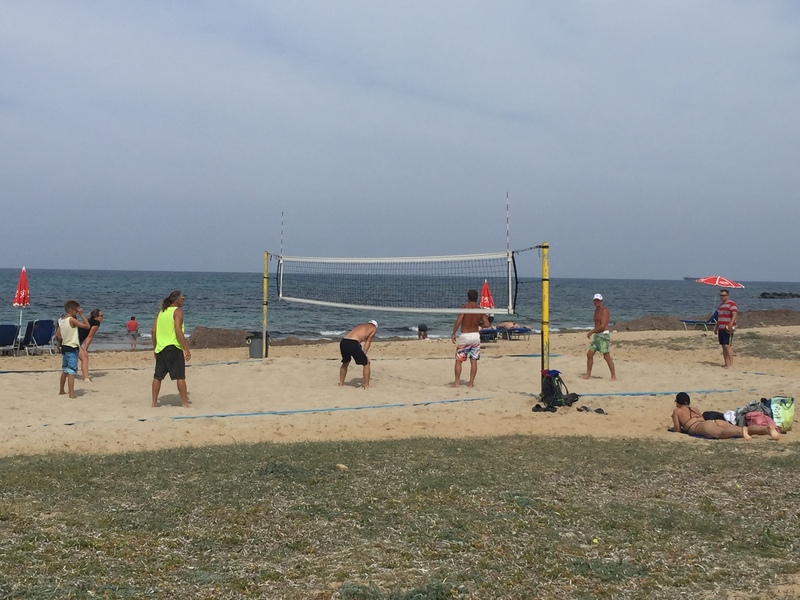 You can find in Paphos well organized beach volleyball playgrounds with the proper height of the net. I’ve mentioned above the cycling – different kind of bikes could be rented everywhere. Swimming and tennis premises can be easily discovered in Paphos as well. It’s a little bit too cold right now for sea swimming, but the number of swimming pools on site is quite impressive. 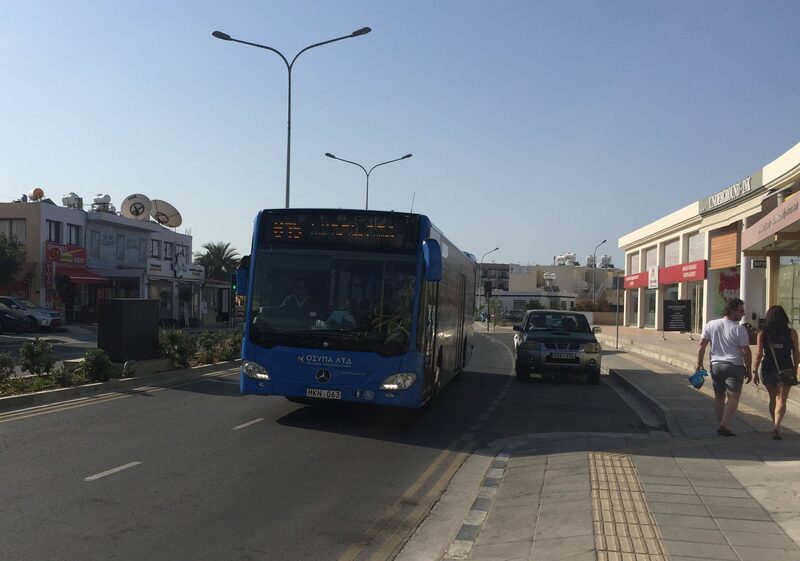 If you are not a walker, then the public transport of Paphos is your way to explore the city. Clean, well routed blue busses link the stations. Most of the vehicles depart from the famous Harbour bus station, next to Kato archeological park. 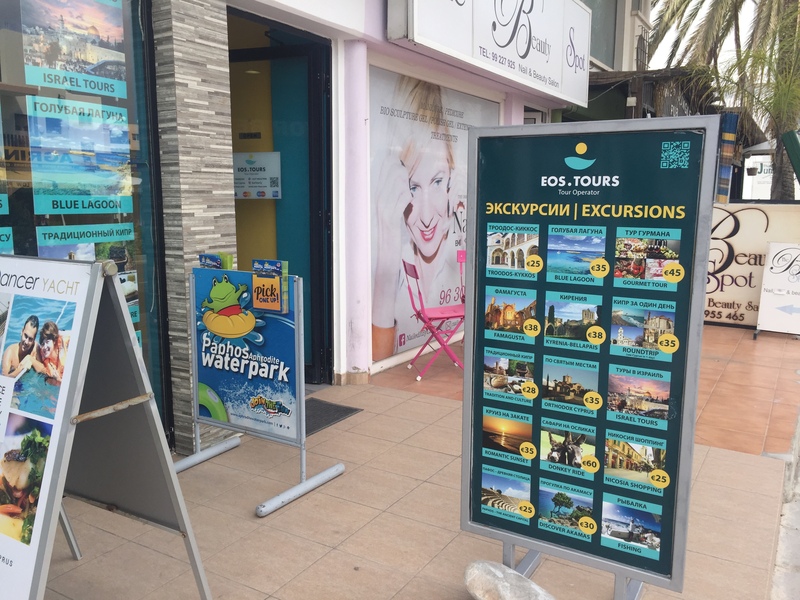 Number 615 goes to the popular Coral bay, 612 – to the International airport of Paphos. One way single fare is 1,50 Euro. The all day ticket is 5 Euro. A weekly card can also be bought – 20 Euro. A monthly card is available for 40 Euro. At night, after 21:00, the night fare ticket is valid – single price 2,50 Euro. The single ticket and all day ticket could be paid also in the bus, directly to the driver. The rest of the cards should be bought and taken in advance at the Harbour bus station. At the same station free of charge is offered a city map with all the routes and bus numbers, covering those routes. Kato Archeological park, the King’s tombs, St.Solomon’s catacombs, the Rock of Aphrodite, plenty of ancient Orthodox churches. Near Paphos there are ethnographical villages, where the pottery and the basket weaving archaic manufacture could be observed. Not so far away are the baths of Aphrodite and the Adonis baths waterfalls, the sea caves and the turtle conservation of Akamas. In Paphos there is also a zoo and a waterpark for the attraction lovers. I was personally attracted to St. Solomon’s Catacombs. This tomb complex is the burial site of the seven Machabee brothers, who were martyred around 174 BC. Their mother was St. Solomon, a Jewish woman who became a saint after the death of her sons. The space is believed to be a synagogue in Roman times. 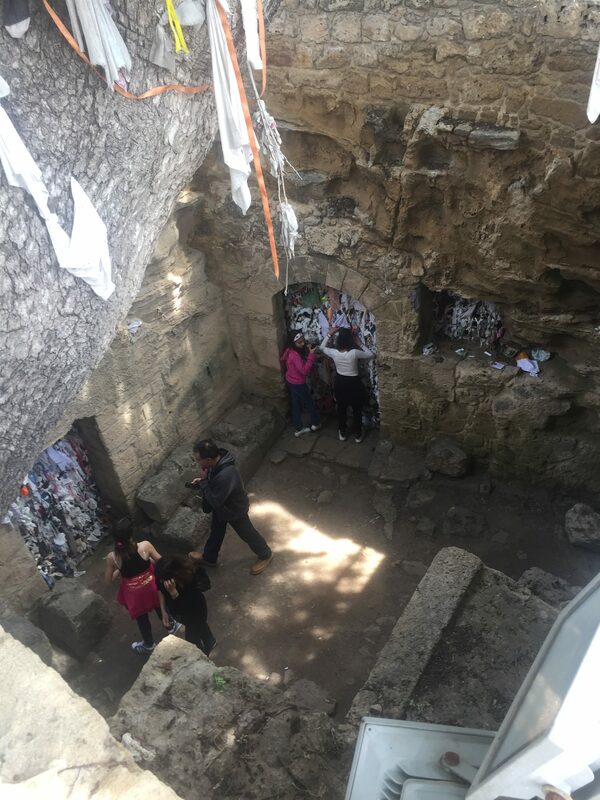 The entrance to the catacomb is free and marked by a collection of votive rags tied to a large tree outside the tomb. It reminded me Demir Baba Teke in Bulgaria, a holly place with a mixed Thracian, Roman, Christian and finally Muslim heritage, where the same rag tiding tradition is still alive. The idea is to say a prayer for someone, then to tie the rug, over the tree. That action names your yearning loudly and keeps it stuck to the tree with the idea one day the wish to come true. 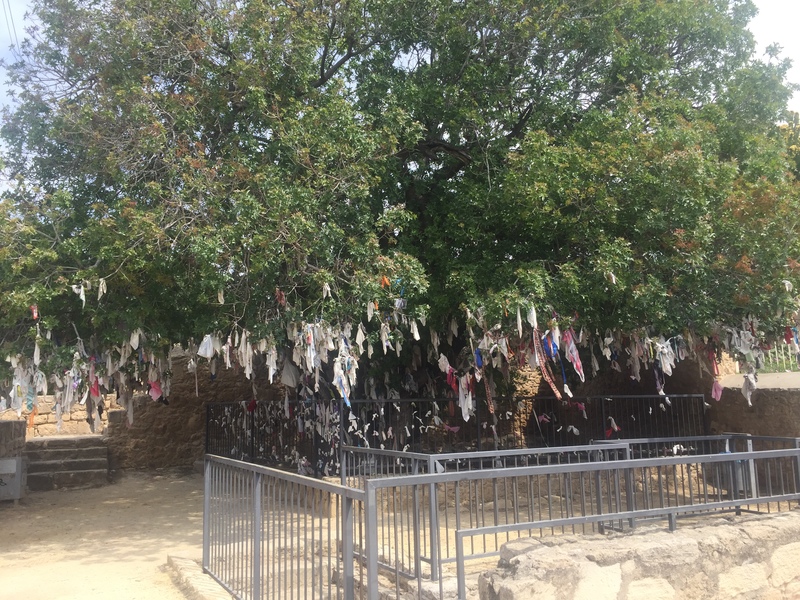 Most people believe in this holly place and intentionally bring scarfs, any white hankies, ribbons and even socks, whatever could tie their prayer around the tree. That’s obvious. No heavy industry on Cyprus. Most of the turnover comes from tourists and agriculture. The air is pure and fresh there. The permanent sea breeze supports and purifies it as well. It’s easy to breathe. 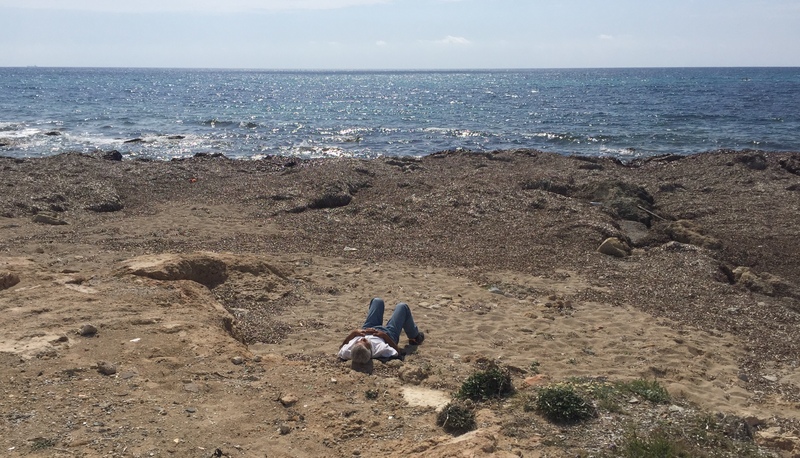 I have never experienced any bad smell, heavy smokes or unpleasant smog in Paphos. No traffic jams, no vehicle crowded or blocked streets. Greek/English/Russian – as mentioned above all is announced in those three languages. If you speak even one of them, you are safe and comfortably allocated, as everyone in the street will be able to speak some or all of them. The most valuable language knowledge is Russian, because the locals mostly speak English, but rarely Russian. Speaking both, English and Russian, is a big advantage in Cyprus. 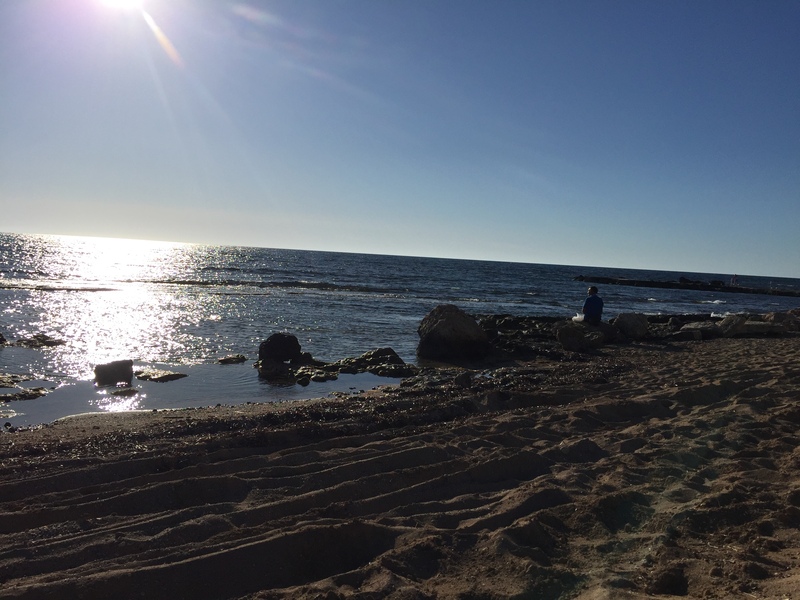 The airport of Paphos is just 20 minutes drive away from the city. It’s very comfortable and easy to go to. It’s reachable by public transport too. The bus number, I used to the airport, is 612 and the single ticket is still 1,50 Euro. Lots of low cost airlines operate at Paphos airport and it’s an advantage to land at, in case you stay in Paphos. The other airport in Larnaka is 120 km away from Paphos. In Limassol, which is 60 km away from Paphos, there is no airport. 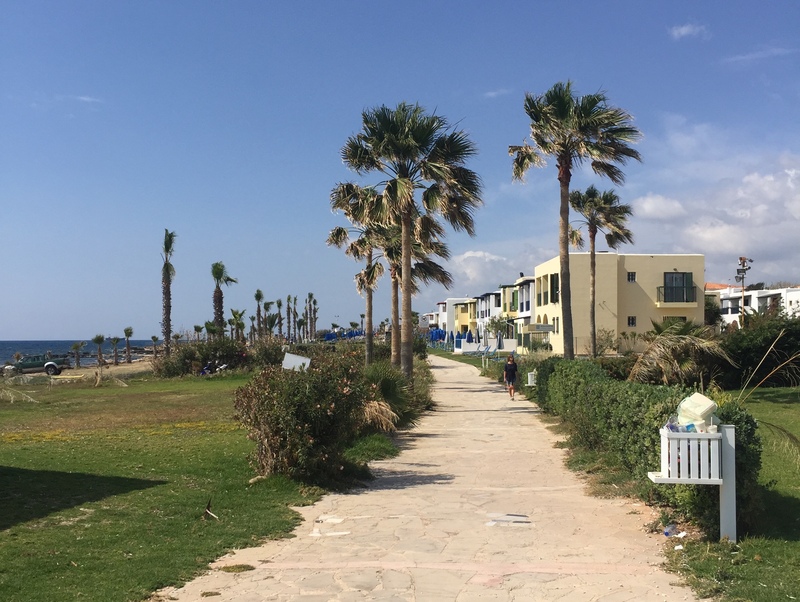 If you picked a holiday in Paphos, arrive on the island after April 15. Prior to this date the nights are quite chilly yet. The touristic life happens at the coastal hotels, around King’s Avenue and the Harbour. Depending on your preferences stay away or closer to. You need stable, free of charge Wi Fi – go to KIng’s Avenue Mall. It opens about 9 am daily. The shops usually open after 10 am. The food corner starts about 9 am. Avoid the Kiosks (It’s written also in Greek ПЕРIПТЕРО). The products are double and triple more expensive there. Avoid the shops, where the price of the item is not tagged to it. The seller would form the price depending on their evaluation of your solvency and looks. 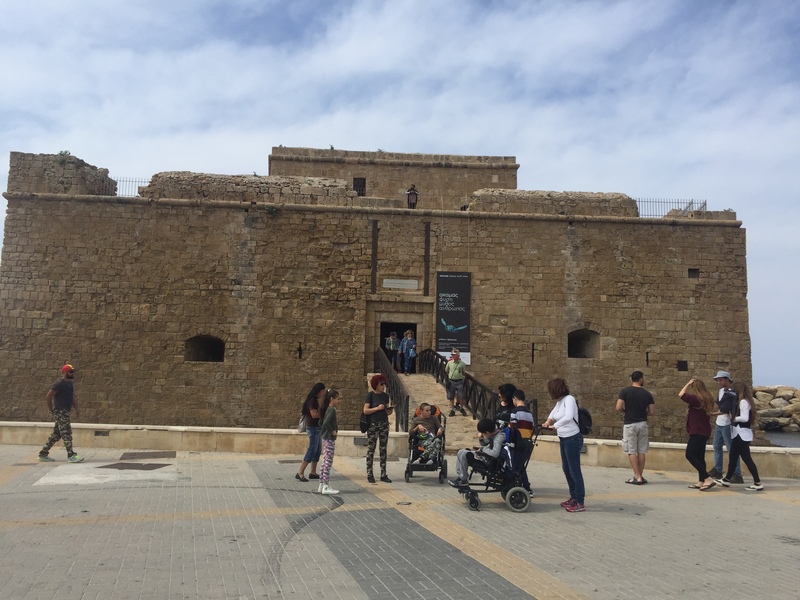 I am on my way to write another article – 10 reasons to avoid a holiday in Paphos, so stay tuned and count the benefits.